The Failed Plan to Build a "Really Greater New York"
Large-scale drainage projects were popular in the early 20th century - but most came to nothing. Some early-20th-century fads, considered modern and progressive at the time, today strike us as quaint enough to seem unreal. Case in point: the giant dirigible airships that once plied the skies. Another one: the urge to reclaim large tracts of land from the sea. Possibly spurred on by the example of the Dutch, who then were in the midst of a multi-decade project to tame the North Sea (see also #372), some early 20th-century visionaries called for reclaiming land on a super-sized scale: drying up the North Sea to reconnect Britain with mainland Europe (#287), or even damming the entire Mediterranean for hydro-electricity and arable land (#296). America wasn't immune to the fashion of the times. In 1911, Dr T. Kennard Thomson proposed to expand New York into its adjacent waters for a grand total of 50 square miles. Thomson was neither a lightweight nor a crackpot. As a consulting engineer and urban planner for the City of New York, he had been involved in the construction of numerous bridges and over 20 of New York's early skyscrapers, specialising in their foundations, designing pneumatic caissons. It was the versatility of these caissons that would lead Dr Thomson to envisage a much wider application for them. In August of 1916, he wrote an article in Popular Science, advocating 'A Really Greater New York'. "At first glance," he writes to suspend his audience's disbelief, "a project to reclaim fifty square miles of land from New York bay, to add one hundred miles of new waterfront docks, to fill in the East River, and to prepare New York for a population of twenty million, seems somewhat stupendous, does it not?" But the future has a way of surpassing our best guesses, just like Thomson's New York would seem unrecognisable visitors of a mere century earlier: "One hundred years ago, Gouverneur Morris, Simeon De Witt and John Rutherford spent four years laying out New York, and went on record as saying that 'the country north of One Hundred and Twenty-first Street would never be covered with houses for centuries to come.' Now apartment houses extend to Yonkers, to White Plains and to New Rochelle." The continuous expansion of the city was generating enormous strains: "New York's overflow has made of Brooklyn a great city. New subways are constantly being built, yet are inadequate when they are completed. Twenty-five years ago New Yorkers felt sure that their water-front would be sufficient for their purposes for many years. Today engineers are searching for some method to cut the knot of New York's harbor congestion problems." Hence Dr Thomson's radical plan: "I propose to add, by a series of engineering projects, fifty square miles to Greater New York's area and port foothold. At the same time this will mean an addition of one hundred miles of new water-front. New York's City Hall would become the center of a really greater New York, having a radius of twenty-five miles, and within that circle there would be ample room for a population of twenty-five millions, the entire project to be carried out within a few years. Many have said 'It can't be done.' The majority of engineers, however, have acknowledged the possibility, and I have received hundreds of letters of encouragement." By Dr Thomson's estimates, enlarging New York according to his plans would cost more than digging the Panama Canal - but the returns would quickly repay the debt incurred and make New York the richest city in the world. He then goes on to describe how he would reclaim all that land. 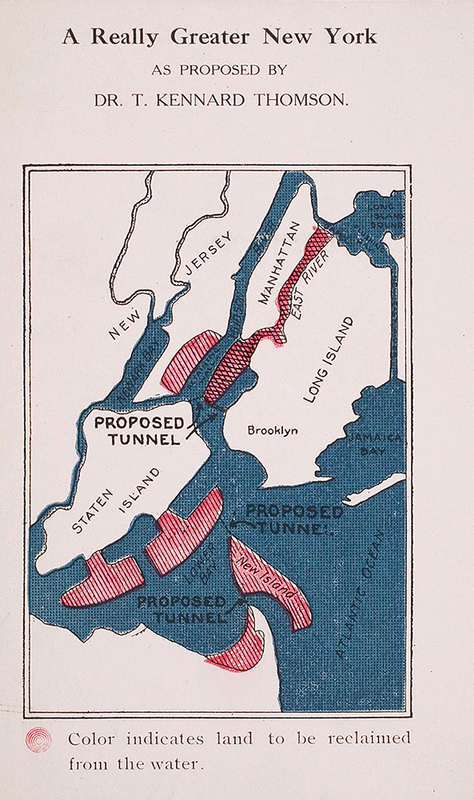 The plan's larger outlines: move the East River east, and build coffer dams from the Battery at Manhattan's southern tip to within a mile of Staten Island, on the other side of the Upper Bay, and the area in between them filled up with sand. This would enlarge Manhattan to an island several times its present size. Proximity and easy access to the new Battery would increase the total land value of Staten Island from $50 million to $500 million. "This would help pay the expenses of the project," Dr Thomson suggests. The project would also add large areas of land to Staten Island itself, to Sandy Hook on the Jersey shore just south of there and create a new island somewhere in between. The East River, separating Manhattan from Queens and Brooklyn, would be filled and replaced by a new canal east of there, slicing through Long Island from Flushing to Jamaica Bays. This canal should, among other things, facilitate protection of New York by the US Navy. 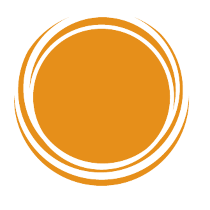 All reclaimed land areas would be connected via underground 'rapid transit' tubes. In the Popular Science article (unabridged text here at Google Books), Thomson seems confident that his project, the cost of which he estimates "from fifty to one hundred million dollars" annually, will soon be executed. No such luck. It is unclear by how many New Yorkers this vision for a Greater City was seriously considered, fiercely defended and deeply mourned. However, it is obvious by the waves still lapping Manhattan's southern tip, that it was never put into action. Thomson tried to rescue his plan by reducing it to its essence. Not a grand vision of a Greater New York, but a more modest proposal for a New Manhattan, a mere nine square miles of Upper Bay reclaimed to form New York's finest, newest real estate and attached to the Old Manhattan. The engineer could already foresee a Four Mile Boulevard, with three separate decks: one each for automobiles, trains and planes. New Manhattan would border a smaller, reclaimed area across the New Jersey state line, encapsulating not only Governor's Island on the New York side, but possibly also annexing Liberty Island - and the Statue of Liberty itself - to America's land mass. But even Thomson's reduced reclamation dream turned out to be just that - a dream. It is unclear exactly why his confidently argued schemes, designed and calculated for profitability, never caught on. We can only conclude that Greater New York nor New Manhattan ever materialised. With the benefit (or deficit) of almost a century of hindsight, Dr Thomson's plans seem as fanciful as Gotham, Metropolis and other fictional re-imaginings of New York City. Many thanks to Joe Buggy at Family Records Genealogy for sending in the second map, found here in the Map Room of New York City's Public Library in the course of his genealogical research. The first map was found here on a blog called Fans in a Flashbulb.